Today's entry in Navigator's Week comes to us from follower Thomas Apple. Tom was involved in creating the chip log used in the 2003 film Master and Commander: The Far Side of the World. In this post, he writes about the use of dead reckoning navigation. Dead reckoning enabled sailors to navigate when conditions did not permit celestial observations. If you could not see the heavens, day or night, you could not fix your exact position. You must plot your course from the last place you fixed the ship’s position to make an educated guess as to your location. To do this you needed certain data. The better the data and the more skilled the interpretation of it, the more accurate would be the resulting dead reckoning. 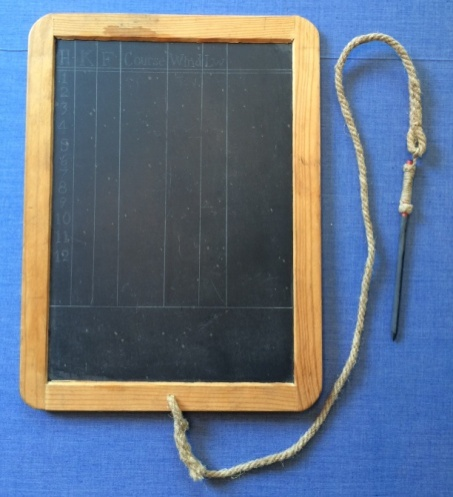 In the 18th and early 19th centuries the data was collected at least hourly and temporarily recorded on a log board (figure 1). The log board, usually a slate, recorded the hour, ship’s speed (knots), ship’s course, wind direction, and leeward drift. Extra observations could be recorded if conditions changed within the hour intervals. Observations were usually made at the top of the hour after the bell had rung. They would be transcribed to the log book at least twice daily. To measure ship’s speed, a log reel and chip were used as well as a small sand glass to keep time. 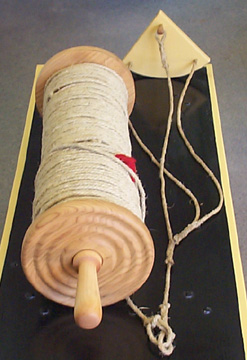 The chip was a quarter circle of wood attached to the end of the log reel line. It acted as a sea anchor that remained largely stationary as the ship sailed away from it. The chip was weighted on the curved edge with a strip of lead to cause it to float with the pointed end facing up. It was attached to the log line with a two or three-leg harness. One leg of the harness was attached to the chip with a peg. 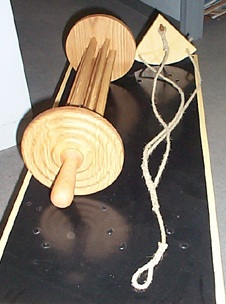 The log reel was constructed of two wooden disks connected by a series of bars that created a sort of drum on which the log line is wound. The bars allowed air to reach the line better making it less prone to rot. This drum rotated on a central axle with a handle on each end (figure 2). The first 12 fathoms of the log line was the stray line to allow the chip to float free of any turbulence in the ship’s wake. After the stray line portion of the log line it was marked with a piece of cloth. 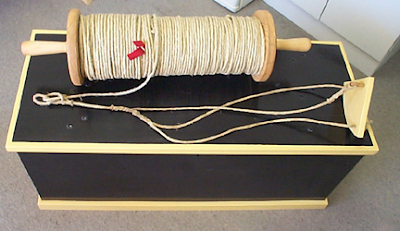 After the marker cloth there were knots tied in the line, each to indicate one nautical mile per hour (figure 3). The spacing of the knots depended on the size of the sand glass used to time the log line. 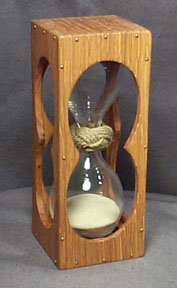 Thirty- and 28-second glasses were the most common with a 14-second glass used for very fast and small craft. If using a 30-second glass, the knot spacing would be 50.75 feet and for a 28-second glass it would be 47.6 feet. These were usually rounded up to the next whole foot, so 51 or 48 feet were usually used as the knot spacing. The sand glass was constructed of two separate globes of blown glass connected to each other with a disk in between with an orifice to control the flow of sand from one globe to the other. They were often connected to each other using a Turk’s head knot (figure 4). To measure speed the chip was tossed over the aftmost rail, the taffrail, and into the water. The log line paid out as the ship sailed away from the stationary chip. When the cloth marker hit the rail, a sailor called out “Turn!” - at which point the sand glass was turned to start timing. The number of knots passing over the rail were counted until the sand glass ran out at which time the person holding the glass called out “Nip!” to grab the log line and stop it from paying out. The number of knots was recorded on the log board. From the time the chip is tossed overboard and the log line nipped, the wind had caused the ship to drift to leeward veering from the course plotted. A protractor was usually inscribed on the taffrail. The crew would lay the log line on this protractor to indicate the angle of leeward drift and then record this angle on the log board. The log line was then given a sharp tug to dislodge the peg in the chip harness allowing the chip to lay flat to the water, making hauling it in much easier. Also recorded were the water depth, course, and wind direction. Water depth was measured using a sounding lead and line. A compass indicated the ship’s course and allowed determination of wind direction. All of these vital pieces are data were used to plot the actual track of the ship from its last known position to hopefully get the ship to where the captain wanted it to go and out of harm's way from grounding or other hazards. William Falconer, An Universal Dictionary of the Marine, or, a Copious Explanation of the Technical Terms and Phrases employed in the Construction, ...of a Ship..., London: Thomas Cadell, 1780 edn. William Brady, The Kedge-Anchor or Young Sailors’ Assistant, Fourth Edition, New York: William Brady, 1849. C. Keith Wilbur, Pirates and Patriots of the Revolution, Chester, CT: Globe Pequot Press, 1984. Log line, chip, and sand glass are reproductions built by author for use in the movie Master and Commander: The Far Side of the World, 2003. The log reel is based on an original example in the Mariner’s Museum in Newport News, VA and the sand glass and log slate are based on an early 19th century examples in a private collection.